After the match number one attraction was USA player.. They were nice enough to answer the media questions after the match in the media mix zone. I asked Tim Howard about first half and the Arda's goal and what he thought about Arda Turan..
American and Turkish fans were Tailgating hours before the match around the stadium.. The Turkish Journalist who came from Turkey fell in love with Financial field stadium and it's press box.. I came here when Turkish International keeper Rustu Recber was playing for Barca in a friendly match back in 2003..
TURKEY STARTED.... USA FINISH IT ! Arda Turan opened the scoring in the 27 minute after getting a beitiful ball from Kazim Richard. Tuncay's shot was deflected and Dempsey could not get to Altidore's dangerous cross in the box. Thirteen minutes in to the second half...Robbie Findley, who came in as sub in the second half ,gave a good ball to Landon Donovan and Donovan narrowly avoided Turkish goalkeeper Volkan Demirel, selflessly setting up Altidore to score the goal easily..
Coach Bradley's four changes were big impact in the second half.. Steve Cherundolo for Spector, Oguchi Onyewu for Goodson, José Torres for Ricardo Clark and Robbie Findley for Feilhaber. Those changes on the defense and in the midfield made a huge difference on USA team.. In the 75th minute, Steve Cherundolo another player who came in in the second half, gave a beautiful ball to Donovan who picked out Dempsey on the left side,the ball bounced off Dempsey’s hip and controlled the ball and kicked it under Volkan Demirel. Bob Bradly said "Turkey was good in the first half but we were better in the second half"
On the other hand Assistant coach Oguz Cetin, said " Americans were more disciplined and much more physically better than Turkish team as a whole team"
USA 2- TURKEY- 1...U.S BEATS TURKEY FOR THE FIRST TIME! The World Cup bound US National mens soccer team will play their last warm-up match against Turkish National team on Saturday afternoon in Philadelphia, Financial stadium at 2:00 PM,ET. USA head coach Bob Bradley, has trimmed his World Cup roster to the 23 players on Wednesday. This has to be the lowest number that represent MLS in the national team! Going back to 1998, there were 15 players from MLS on the World Cup roster. But, there are 13 former MLS players on the roster who are playing in the Europe's top leagues! Turkish National team after finishing third place in 2002 has not been in the tournament. United States is the only country in the world, that sends more goal keepers to Europe league. Three of the keepers on the 2010 World Cup roster are playing in the Europian leagues..
Turkish National team hired the world known coach Guss Hidink to coach the team..
That is why a lot of the players on the Turkish National team roster, playing very hard to impress Hiddink! On Saturday you will see the top Turkish players on the pitch aloong with newcomers! Along with those names you will have stars like Arda Turan, Emre Belezoglu,Nihat Kahveci, Tuncay Sanli and Altintop brothers and keeper Volkan Demirel.. 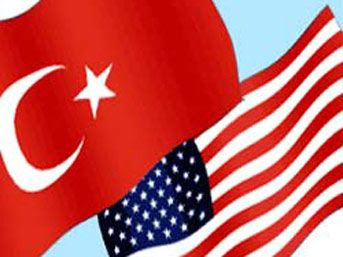 I wish, at the end of the match, on the pitch, both team players will salute the fans in hand and hand showing the solidarity for the friendship between Turks and Americans! That is my wish and dream! 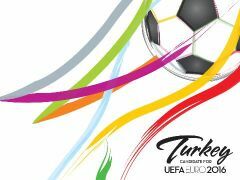 COULD TURKEY GET EURO 2016 TOURNAMENT? Turkey's bid offered UEFA had a unique chance to "build a bridge between Europe and the mystic Orient". The bid said hosting the Euro 2016 finals would greatly contribute to the growth of football thanks to completely modernised sports infrastructure, long-term legacy benefits that were acknowledged in the UEFA report. TFF: "We are ready for the final presentation"
EURO 2016 Project Director Orhan Gorbon, answered the questions of AA reporter at the TFF headquarters in İstinye. While indicating that the presentation that will be delivered prior to the UEFA Executive Committee's meeting on Friday May 28th will be very important he said "We will be the first bidder to deliver our final presentation that will take 30 minutes. In this half hour we will try to get together everything we have been telling to this day and it will be a great opportunity to tell all to everyone one last time." He also pointed out that EURO 2016 would be the perfect opportunity to advertise Turkey. Gorbon said "For example in 2014 the Ministry of Tourism will start a campaign all around the world, situated in the airports with the theme "We are looking forward to see you in Turkey in 2016" Advertising by the money you pay is one thing but having a theme as this one is another thing. Both will come together to change the image of Turkey." Orhan Gorbon said "5 million tourists are expected to visit Turkey for the tournament. They will be around for the whole month and all the hotels will be fully booked. New stadiums, new facilities will be built. This is very important for the construction, transportation and telecommunication sectors. Total income is estimated at around 4 billion euro. If we win this week, touring agencies and media companies will come to Turkey as soon as next week, on Monday. People in European football industry will hopefully turn their heads towards Turkey after Friday" to finalise his words. France has emerged as the favourite to host the 2016 European Championship following the publication of UEFA's evaluation report on the three bids for the tournament. The France bid calls for $2.1 billion to be spent on seven major stadium renovations and four new-build projects; Saint-Denis stadium is an existing venue. On the other hand Italy's bid only one of the 12 proposed host stadia exists; eight would be revamped with three new constructions. Italy would invest $919 million on improving its stadia infrastructure. Turkey Beats Northern Ireland 2-0, in the second Friendly match. First, good news to the Turkish National player, SELCUK INAN, because of my web site and this Turkish football blog, American female by the name Janet Bedin, contacted me,through mail. I than, Twit the news, on the Twitter and Facebook. And I asked my Turkish Journalist friend in Turkey,Cuneyt Karakaya,who has a web site called www.Ataryemez.com ,to help me out on this. and in the mean time, I contacted the Turkish football Federation press officer, Turker Tozar, through the e-mail. Make the story short , Selcuk Inan's passport and his valet has returned to him. It was all Turkey in the first half of the match but there was no score on the board for Turkey. Early in the second half,Sercan Yildirim scored in the 48th minute and Semih Senturk added a goal in the 71st minute as Turkey rolled to a 2-0 victory in a friendly match before only 3,021 fans! Sercan Yildrim took a pass from Selcuk Inan, (the player who received the good news about his passport before the match) on the left and beat goal keeper near the right post. Later, Semih Sentruk controlled a loose ball about 25 yards out and beat N. Ireland keeper. The mood will be really high when they get on the pitch on Saturday in Philadelphia! Because,The Lincoln Financial Stadium is very nice and one of the best stadiums in the United States and there will be almost full house around 70 thousand soccer fans in the stadium. Turks back to work after one day off. After Turkey's Top man Guss Hiddink gave his players one day to enjoy Turkish Festival in Manhattan and boat ride around Manhattan island yesterday, the prepartions started on Monday for the Northern Ireland match in Veterans Stadium (New Britain, Connecticut)on Wendsday . 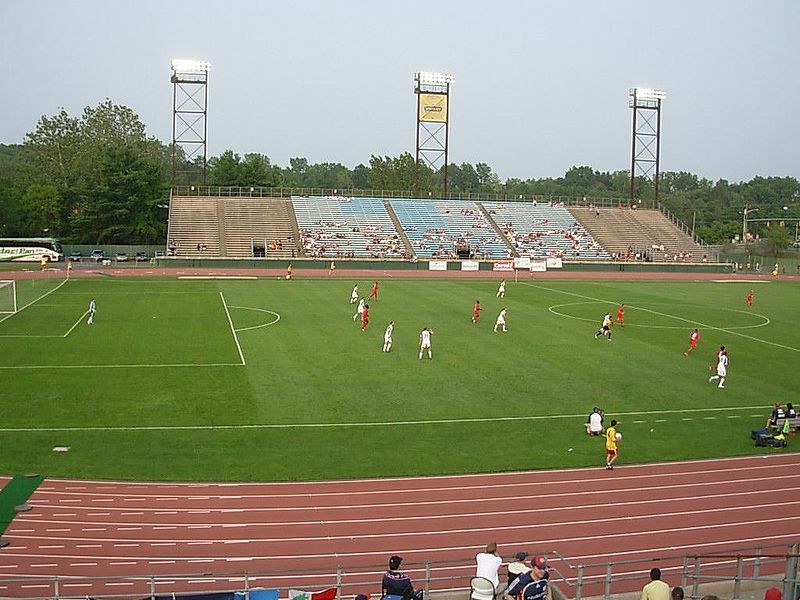 The stadium is prety small and the local high school uses the pitch for their soccer match. Mehmet Topal and Mehmet Topuz did not practiced with the team today and Hamit Altintop joined the camp but he will not start to practice for another day. The bulk of the players participated in training and after training without the ball, Training, lasted approximately two hours. At the end of the players had to do "Halay" Turkish dance for the punishment! Turkey Football Federation Chairman Mahmut Özgener followed the practice too. Turkish National Team. will face Northern Ireland on Wednesday at 13:30 pm ET, on a high school soccer field.. It will be high,low and High, roller coaster, matches for Turkish National team after playing in front of near 17 thousand fans in the Red Bulls Arena on Saturday. They will not see that much fans on Tuesday Afternoon, in Veterans stadium.. But, Hold on....against USA in Philadelphia, in the send of match, for US Mens National team there will be full house in the Financial Stadium. There will be a lot of USA fans and Turkish-American fans at this important match. US coach Bradley, will put his real team that he will use in the World cup tournament. As far as Turkey, the players have to show them selfs, to the new coach Gusss Hiddink. That is why, with a huge crowd in hand and excellent stadium,it should be good match on Saturday in Philly. Lastly, we Turkish-Americans don't want to be like Mexico fans in the United States! Let's Support Turkey and the USA team, who is going to the biggest dance, in the World. 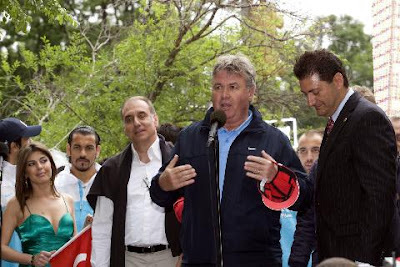 Turkish American Federations President Kaya Boztepe welcomes the National team and Guss Hiddink to the Turkish Festival. Turkish National team players,coaches and officials attended to Turkish Day Festival in Manhattan.New York on Sunday. TFF president Mahmut Ozgener said that they were delighted to be part of the Turkish festivities and Thanked the Turkish) Americans to support the team in the first ever friendly match they played in the United states soil against Czech Republic in Red Bull Arena on Saturday. Turkey's new head coach Guss Hiddink also thank the fans coming out and supporting the team on Saturday. He finished his remarks by saying in Turkish "En Buyuk Turkiye"
Turkish National team enjoyed the boat trip with Turkish media around the Manhattan island too. Some of the players including Emre Belezoglu got sick from the boat trip. Guss Hiddink cancelled the Sunday night practice , they will practice on Monday with light work out and than on Tuesday they will play their second friendly match against Northern Ireland in Connecticut . Turkey will play the most important friendly match against USA on this coming Saturday in Philadelphia. This match will bring a lot of attention to Turkish National team from National media in the United States. This will be the last match US team will play in the United Stated before the world Cup Tournament. Look for large crowd on Saturday in the Lincoln Financial Stadium. U.S.A National mens team will put out their starting line up against Turkey in this match. 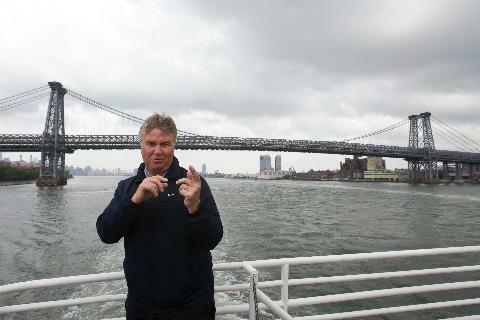 Hiddink: "I want to install balance between players in the Turkish National team"
Turkish National team coach Hidddink held his first press conference in Hoboken,New Jersey along with Emre Belzoglu and Turgay Bahadir from Bursaspor. Hiddink told the press that he will install balance on the team as far as every one is working on one point playing total football. Turkish national team player Emre Belözoğlu from Fenerbahce said "If you are a professional you need to act accordingly. . I congratulate Bursaspor. " Turkish National team practiced at Montclair University filed in New Jersey twice on Thursday. After training, Halil Altintop and Guus Hiddink ahd a little talk between them. .
Training portion of Turkish National team was followed by the Football Federation Chairman Mahmut Özgener too. Arda Turan also signed autographs after the match. Turkish National team will practice in Red Bulls Arena on Friday at 11:30 local time. As the time approached the last minute of the match , Besiktas scored goal and made it 2-1. In Bursa, The match finished and they were waiting eagerly the good news from Fenerbahce stadium. This was the second time other than big three Istanbul Teams won the league's title..
Lastly, I am sure a lot of the soccer fans, outside of Turkey , probably asking, where this Bursa, came from all of sudden? Well deserved run....you guys deserve it..
Now, it is time to think big, for Champions League! Turkey's 33-man squad and programme for the upcoming USA tour has been announced today. Fenerbahçe players Gökhan Gönül and Özer Hurmacı have been excluded from the squad as both players will undergo a shoulder surgery at the end of current season. Paris Saint-Germain forward Mevlüt Erdinç was not included in this squad as he is expected to have a wrist operation on 18 May. Galatasaray left-back Hakan Balta was also left out because of a persistent groin injury. Meanwhile, Bayern München midfielder Hamit Altıntop will join his team-mates in United States on 23 May after taking part in his side's UEFA Champions League final match against FC Internazionale Milano one day before. Elsewhere, Real Betis' holding midfielder Mehmet Aurelio will be missing the USA tour as the season will still be active in the Spanish Second Division. Turkey squad will gather on 18 May starting from 19.30 at Swissotel in İstanbul. They will fly from İstanbul to New York on 19 May at 10.00 and land at 13.30 with local time. Then the squad will travel to New Jersey at 14.30 by bus and arrive at W Hoboken Hotel where they will make their camp. On 20 May, coaching staff and certain players will participate in the special reception which is organised by Turkey's New York Consulate General. Turkey squad will pass to Manhattan by ferry on 23 May Sunday to take part in the Turkish Day activities that will begin at 13.00. Having enjoyed the activities, they'll make a boat trip with the participation of media representatives. 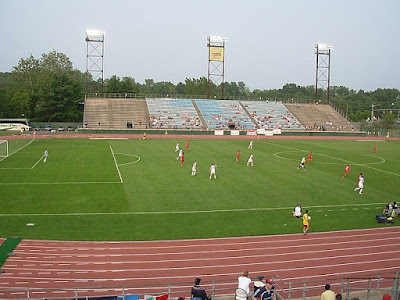 Turkey will travel to Connecticut from New Jersey on 25 May at 10.00 by bus and will make their camp at Connecticut Crown Plaza Hotel in Hartford. After playing Northern Ireland friendly, the following day at 18.30 they will fly from Connecticut to Philadelphia where they will accomodate in Hyatt Regency Philadelphia. The squad will pass to New York on 29 May with 17.30 flight and return to Turkey on 31 May with a charter on 14.00. 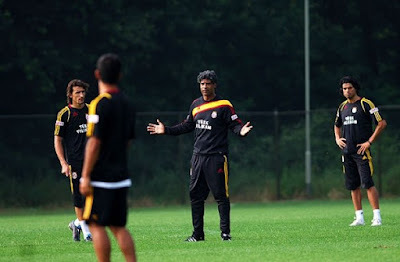 FRANK RIJKAARD UNDER FIRE BY TURKISH PRESS! This weekend's loss at home against Antalyaspor in the last seconds of the match was the driller for Rijkaard. While He was talking to LIG TV reporter, he said exactly this...."It was a bad day for us, and these kinds of defeats make us feel bad. It’s got nothing to do with concentration or mentality, but with quality. When you’re one goal up, you have to keep control of the ball.” he added. That "QUALITY' word has been the main attraction. from Turkish media..
"When you’re one goal up, you have to keep control of the ball." He was upset and disgusted, after that last minute loss..
Now,the Turkish media even talking about sacking Rijkaard and bring in Fatih Terim, back! Frank Rijkaard has been under very heavy fire, because he is not playing Turkish National team stoper Servet Cetin on the team too! 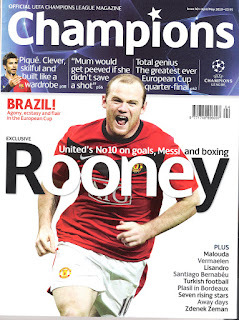 Just in this month's UEFA' "Champions" magazine, Frank Rijkaard was quted as saying, "Football here is emotional and that can make long-term planing very difficult,you can't tell people be patient"
I think another world famous foootball coach will leave Turkey , just like the other ones! Fenerbahce this season was eager to get both of the cups , but coach Christoph Daum has only one price deal: the championship. They loss the Turkish Cup to Trabzon on Wednesday in Sanliurfa,Turkey,3-1. In the first half Trabzonspor looked good and had more chances. But, Fenerbahce Keeper Volkan Demirel, made some key saves, in the first half. After 0-0, first half, Fenerbahce's Alex De Souza scored in the 55th minute. However,Trabzonspor striker Umut Bulut after missing few in the first half of the match, equalized the score in the 66th minute, midfielder Engin Baytar made it 2-1. In the 80th minute and Gustavo Alejandro Colman scored in the third minute of stoppage time to give Trabzonspor 3-1 victory. On the other hand, Fenerbahce ,who has not won the cup since 1982-83 season! 27 years of drought, still continues for Fenerbahce and Fenerbahce fans,,,,,,. TURKISH CUP UP FOR GRABS! Trabzonspor will take on Fenerbahce on Wednesday in the 48th final of the Turkish Cup, in the southeastern city of Sanlıurfa. The match,will kick off at 3:45 p.m local Turkey Time(08:45 AM,ET) will be the first time the two teams clash in the final of the cup competition as Fenerbahce tries to end a 27-year cup thirst. The Urfa GAP Arena, opened at the beginning of the season and it is brand new stadium. Daum warned his players that, despite leading and being a cup finalist, the club has not achieved anything yet, and there is no room for complacency. On the other hand Trabzonspor, will be ready for Fenerbahce in the final. Trabzonspor coach Senol Gunes also claimed ,that they are focused for the cup final match too! Turkish Cup,is sponsored by Ziraat Bank of Turkey. The teams on top of the Turkish Turkcell super league, all won their matches in the 32th week. Bursaspor already secured the second place and the Champions League for the next season with a win against Kayserispor. Bursaspor is one point behind Fenerbahce and they will earn three points without playing in the 33th week. Even though Galatasaray won their match,there is no way they could catch Bursaspor, after this weekend..
Galatasaray finished 32th week, in third place with Milan Baros goal in their 1-0 win at Istanbul BB. Galatasaray will play in the Europa League next season. The pressure will be on once again on Fenerbahce in the 33th week. Fenerbahce also will play Turkish Cup final match against Trabzonspor this coming Wednesday, before the clash with Ankaragucu in Ankara! A draw or a loss against Ankaragucu , could make Bursaspor the top team at the end of 33th week. That is why this has to be the most important week in the Turkish Super League.. If Fenerbahce lose point and points this coming weekend, we could see two final matches in the last weekend of the season. Fenerbahce will be home against Trabzon and Bursaspor will host Besiktas in Bursa..
On the other hand Besiktas clinch European berth with a win against Diyarbakirspor in Diyarbakir. With this loss, Diyarbakirspor have a slim chances to remain in the league. 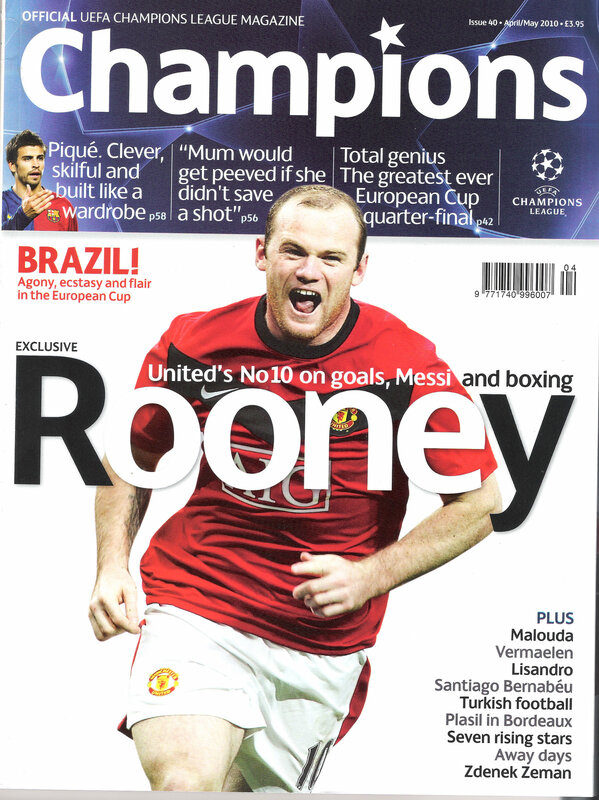 Can they do it nine in a row out of ten matches?. Get ready for down to wire race, on top of the Turkey's top league.